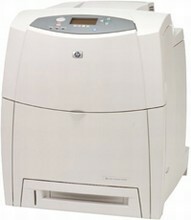 The new HP Color LaserJet 4600 printer gives you high-speed color laser printing - at an affordable price. Improved over its successful predecessor, the 4550, the 4600 offers: 1) over four times faster color printing at 17 ppm, 2) 2 large paper trays with 50% more capacity (100-sheet and 500-sheet) and 3) 72% more processing speed and 50% more memory, 400MHz and 96MB, for fast printing of complex jobs. This powerful printer is also expandable with optional networking, extra 500-sheet paper tray (for a total of 1100 sheets) and upgradeable memory to 416MB.